Three Jacksonville students got a big surprise last week. It started like any other morning for Billy, Chris, and Nick, who walked into Robert E. Lee High School and headed to first period with Ms. Donofrio. Things took a turn as they were greeted by a PA announcement stating they had beaten dozens of schools to win a national kindness challenge. The KIND Schools Challenge, launched earlier this year by The KIND Foundation, a nonprofit started by KIND Snacks and Making Caring Common (a project of the Harvard Graduate School of Education), encouraged young people across the country to develop projects that fostered kindness and inclusivity at school. Their school, Jacksonville’s Robert E. Lee High has long been plagued with violence and segregation. Billy, Chris and Nick’s #YourStoryisMine entry rose to the top after they successfully helped unite a divided student body – many of whom live under the poverty line and face significant challenges at home. To put it in perspective, in Ms. Donofrio’s 13-person class alone, 11 students have seen someone get shot, 11 have an absent parent, 12 have a family member in jail and 13 have been detained and questioned by the police. 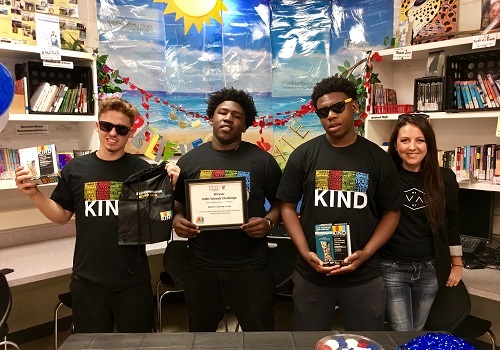 According to Dana Rosenberg, Foundation Director, the students at Robert E. Lee High School embody KIND’s mission. She says, “The winning team, along with all of the students that submitted ideas, demonstrate young people have the vision, creativity and drive to build kinder, more inclusive communities. The KIND Foundation is proud to celebrate these student leaders and their visionary teacher Ms. Amy Donofrio; they are an inspiration and their efforts reinforce how kindness and empathy have the power to make this a better world. We look forward to seeing their continued impact within the hallways of Robert E. Lee and beyond. These brave students will each receive a monetary award, and the school will receive a donation from The KIND Foundation to sustain the project through the next academic year. The project #YourStoryIsMine will also be incorporated into a toolkit that will be distributed to teachers nationwide, so that others can establish a similar plan into their own curriculums.